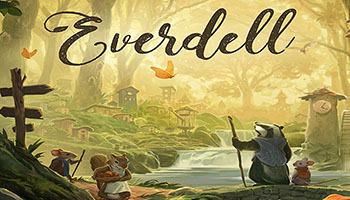 Within the charming valley of Everdell, beneath the boughs of towering trees, among meandering streams and mossy hollows, a civilization of forest critters is thriving and expanding. From Everfrost to Bellsong, many a year have come and gone, but the time has come for new territories to be settled and new cities established. You will be the leader of a group of critters intent on just such a task. There are buildings to construct, lively characters to meet, events to host-you have a busy year ahead of yourself. Will the sun shine brightest on your city before the winter moon rises? 1 Place the board on the table. Place the Ever Tree on the stump at the top of the board. 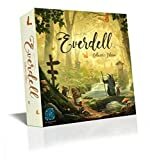 When playing Everdell solo, you will be competing against a cantankerous old rodent known as Rugwort, and his pack of rowdy, rambunctious, rat ruffians. He will be returning to Everdell for three years in a row, each time bearing a new title of nastiness. 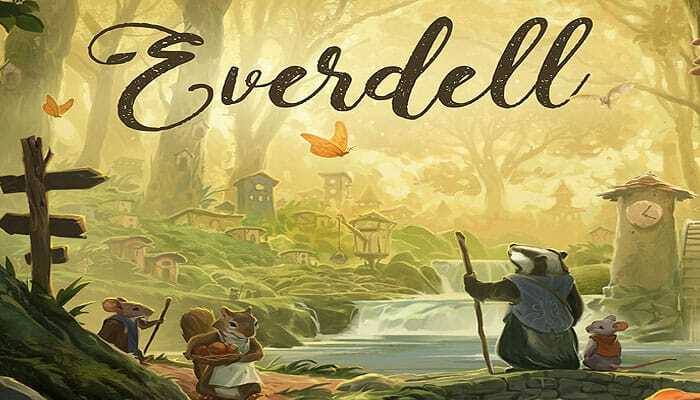 You must find a way to overcome his dastardly tricks and rid Everdell of his filth once and for all. Year One: "Rugwort the Rascal"